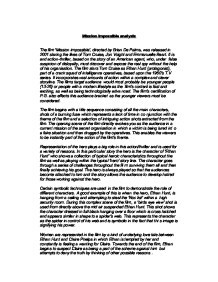 Mission impossible analysis The film 'Mission impossible', directed by Brian De Palma, was released in 2001 staring the likes of Tom Cruise, Jon Voight and Emmanuelle Beart. It is and action-thriller, based on the story of an American agent, who, under false suspicion of disloyalty, must discover and expose the real spy without the help of his organisation. The film stars Tom Cruise as Ethan Hunt (protagonist), part of a crack squad of intelligence operatives, based upon the 1960's T.V series. It incorporates vast amounts of action within a complex and clever storyline. The films target audience would most probably be younger people (13-26) ...read more. The opening scene of the film directly evolves you as the audience in a current mission of the secret organisation in which a victim is being lured into a fake situation and then drugged by the operatives. This enables the viewers to be instantly part of the action of the film's theme. Representation of the hero plays a big role in this action/thriller and is used for a variety of reasons. In this particular story the hero is the character of 'Ethan Hunt' who shows a collection of typical heroic characteristics throughout the film as well as playing within the typical 'hero' story line. ...read more. During this complex scene of the film, a 'birds eye view' shot is used from directly above the mid air suspended Ethan Hunt. This shot shows the character dressed in full black hanging over a floor which is cross hatched and appears similar in shape to a spider's web. This represents the character as the spider in control of his web and is symbolic in the fact that this image is signifying his power. Women are represented in the film by a kind of underlying love tale between Ethan Hunt and Claire Phelps in which Ethan is tempted by her and constantly is feeling a wanting for Claire. Towards the end of the film, Ethan begins to suspect Claire as being a part of the scheme against him but attempts to deny the truth by thinking of other possible reasons. ...read more. X It is a simple scene about time, love and being cheated by life itself. XI They march into the town and wait for 10 hours. Then they com about 3 thousand of them with all sort of weapons but they lay them down as a sign of respect to the Spanish because they believe they are gods. There is a mixture of diagetic and non-diagetic sounds in MI2. The non-diagetic rock music gets the audience pumped up ready for the action packed scenes. The diagetic sounds such as the eagles enforce the director's efforts to make the dessert seem inhospitable. 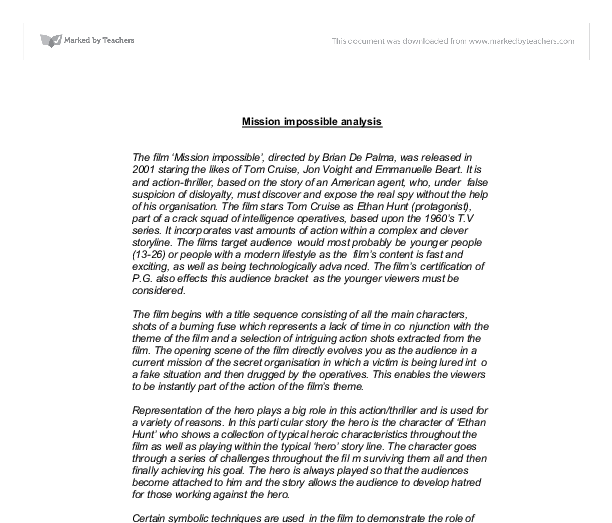 How is the trailer for Mission Impossible Two constructed to attract an audience? I will be analysing two trailers: for &amp;quot;Mission Impossible 2&amp;quot; and &amp;quot;X-Men&amp;quot;. In the "X-Men" trailer the first scene starts very slowly and zooms into a set of opening automatic doors. This then shows the audience the location in which the movie is set, similar to the layout of the clips in "Mission Impossible 2". to a small and innocent Louisianan town, as if to present them with the normal state of the town at daytime. This example is very effective in that the audience are intrigued to know what will happen to this peaceful and quiet town to make it seem so disturbed.